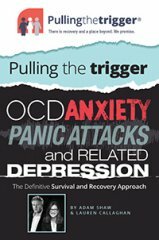 From the heart and soul of a lifelong OCD and anxiety sufferer, combined with the expert mind and experience of a leading clinical psychologist, Trigger Press Publishing are proud to introduce the simple, yet highly effective, self-help method of Pulling the Trigger. Adam Shaw is a world-wide mental health advocate, philanthropist, author and co-founder of the successful global charity, The Shaw Mind Foundation. Lauren Callaghan, born and educated in New Zealand, is an industry leading psychologist based in London and is renowned as an expert in the field of mental health. "Dr Lauren Callaghan and Adam are amazing. Their methodology provided in this innovative self help book is enlightening and inspiring." Tina Mastramico, On-Air Personality, Los Angeles, KSWD, 100.3 The Sound, an Entercom Station. What is 13 - 2 ? This book has really helped me to understand my illness. I feel as though I am in a much better place and finally getting somewhere with my recovery! Thanks Adam and Lauren! Books like these desperately need more coverage and definitely need to be published more often.